It was a day of Korean success in Hungary as their skaters took women's 3000m relay and 1000m gold, to add to their men's win in the 1500m. Choi Min Jeong won the 1000m, while Lim Hyo Jun took the honours over 1500m, before the women's team of Choi, Shim Suk Hee, Kim A Lang and Kim Ye Jin capped a fine weekend at the first World Cup of the season. Elsewhere, Canada won the men's 5,000m relay thanks to their quartet of Charles Hamelin, Charle Cournoyer, Samuel Girard and Pascal Dion – but it was the Koreans who ruled the day. 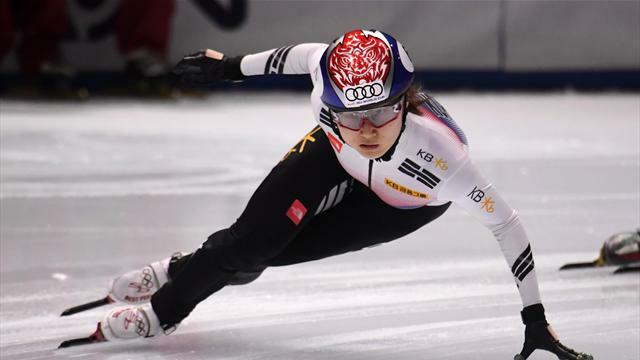 Choi had won both the 500 and 1500m on Saturday, and edged out Canada's Kim Boutin and Britain's Elise Christie to take gold. "I'm really happy. I feel more confident now than yesterday," she said. "The final race was pretty easy because I had such good results yesterday and got a lot of confidence." Choi picked up a fourth gold in the women's relay, with Canada coming in second and Russia third, while in the men's event it was China picking up silver with Japan getting the bronze. And it was a Korean one-two in the men's 1500m, with Lim taking gold ahead of countryman Hwang Dae Heon – ensuring they repeated the result of Saturday's 1000m. China's Han Tianyu picked up the bronze medal, with the World Cup circuit now moving onto Dordrecht, next weekend.